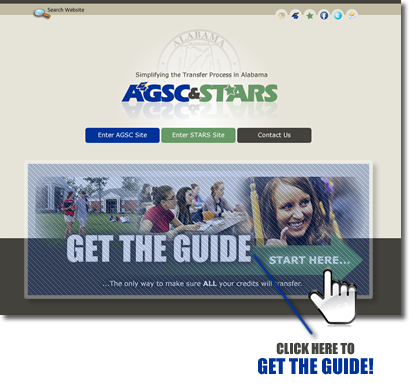 Access the AGSC/STARS Web Site - www.gettheguide.net or stars.troy.edu. 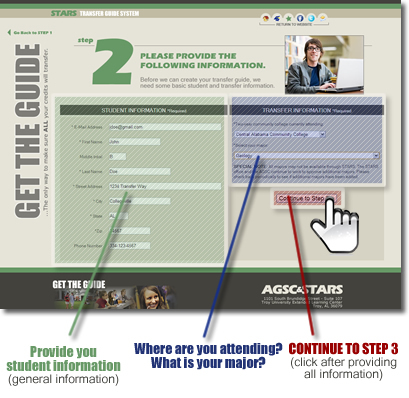 Click on any image or button that says "GET THE GUIDE - Start Here..."
Click on OFFICIAL if you are a transfer student and need to obtain/print an OFFICIAL transfer guide. 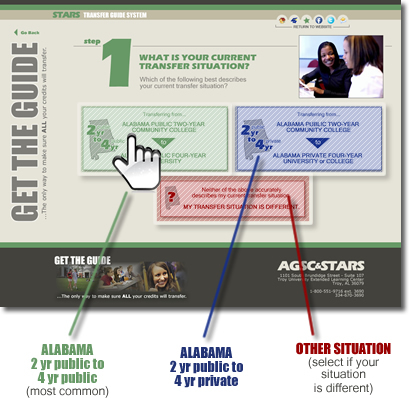 The UNOFFICIAL guide should be used by administrators and counselors for advising purposes. NOTE: The green button will take you to the remainder of the STARS System to obtain an official transfer guide. The blue button will take you to a page where you can access transfer guides for the state private institutions. The red button will take you to a page where you can give us more information about your transfer situation. 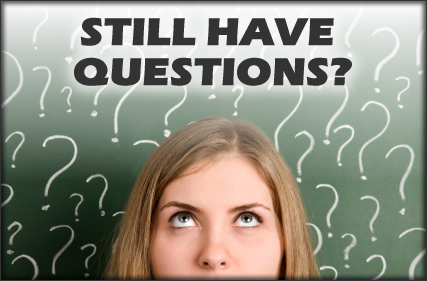 From there we can give you additional advice or information to aid in your transfer process. 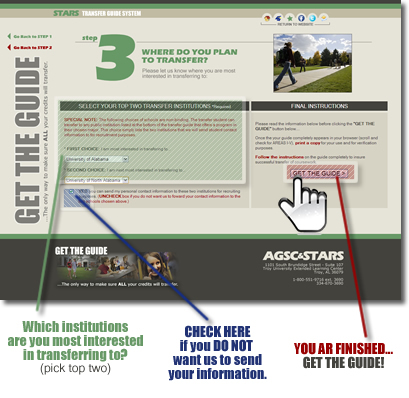 In STEP 3, we need to know which institution(s) you are most interested in transferring to? WHY DO WE ASK THIS? - The reason we ask this is so we can send only the institutions you are interested in your contact information and let them know that you are using a STARS Transfer Guide. These institutions my contact you by mail, e-mail or sometimes phone (but not normally). The simply use the information to try to recruit you to their institution upon transfer. IF YOU DO NOT WANT US TO SEND YOUR INFORMATION TO THE UNIVERSITIES YOU HAVE SELECTED, click the check box beside the schools and we will not forward your information. ...what do you do now? 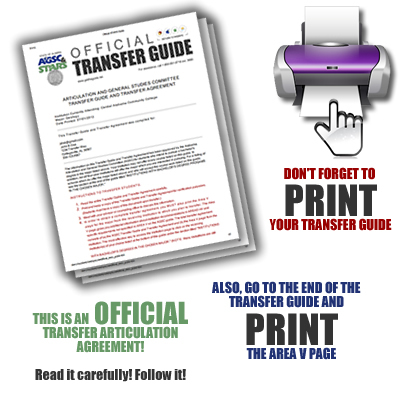 Read the entire Transfer Guide and Transfer Agreement carefully. Meet with your advisor or counseling office to discuss this information. In order to obtain a complete transfer agreement, you MUST also print the Area V page for the major from the receiving institution to which you plan to transfer. The Area V page gives you additional information about institution recommendations in AREAS I-IV and specific requirements not specified in AREA V on the AGSC guide. 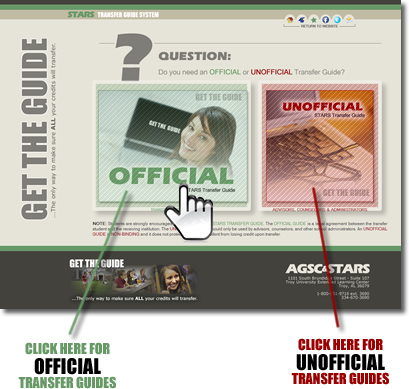 The total transfer agreement consists of (a) the AGSC Transfer Guide and Transfer Agreement and (b) the Area V page from the institution. The most effective way to access the institution page to click on the receiving institution(s) of your choice listed at the bottom of this guide under the section titled "INSTITUTIONS WITH BACHELOR'S DEGREES IN THE CHOSEN MAJOR."